According to the World Steel Association, 1.7 million tonnes of crude steel were produced worldwide in 2017. The production of steel in plants and mills relies upon heavy plant equipment operating under extreme conditions, including high speed, high impact loads, high temperature, and cooling water ingress, all posing a serious threat of contamination and lubrication failure. This means that the lubricants used in this industry require constant monitoring and maintenance, and due to the highly competitive market, fluctuating steel prices and increasingly strict environmental regulations, profitability relies upon optimising every step of the production process. Lubrication monitoring techniques have therefore moved from being viewed as an ‘optional extra’, to a ‘business critical’ requirement in a step towards total predictive maintenance. Extending oil life, thus extending service intervals, maximising productivity, reducing change-out downtime and procurement costs. 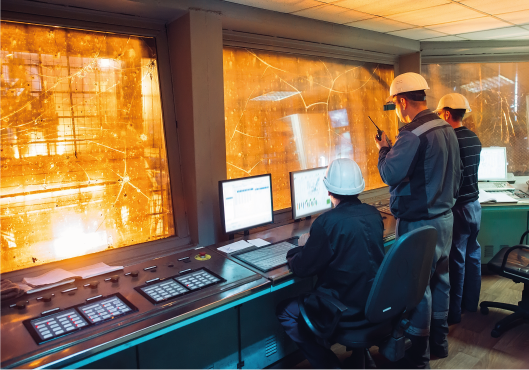 Reducing risks and contributing to safe and reliable plant operations. By using traditional methods of manual oil sampling and lab testing, symptoms of oil degradation are easy to miss. Tan Delta’s real-time technologies are perfectly designed for hydraulic, gearbox, transformer and other steel processing equipment applications. The patented Oil Quality Sensor (OQSx) and display units can be easily retro-fitted to existing systems and live data readings allow operators to quickly identify a change in oil condition and direct maintenance action accordingly. Tan Delta’s unique technology ensures that oil condition is optimally managed, giving you the peace of mind that your steel plant is always running efficiently. – Steve Marshall, Forgemasters, Group Engineering Director.